About 28 miles west of Lands End (Cornwall) are the mysterious and little known islands called the Isles of Scilly. As you might expect, the isles have a very mild climate and are populated with sub-tropical plants. When you travel anywhere in Cornwall, you’ll be amazed at the abundance of wild flowers that fill hedgerows and cover woodland floors in its beautiful natural display. However, when you visit the Isles of Scilly, the flower fields here will bowl you over. Cut flowers are the main agricultural product of these isles and Isles of Scilly flowers are famous throughout the UK. 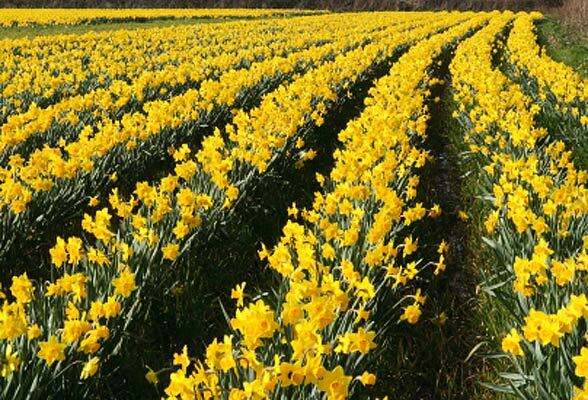 Due to its sub-tropical climate, this area has a long association with traditional narcissi growing and many popular and important varieties are developed here. Trenoweth Flower Farm is one of the Isles of Scilly flower farms which has consistently taken out the first prize (sometimes second and third as well) at the West Cornwall spring flower show each year. The farm is set in a peaceful wooded part of St. Mary’s on the Isles of Scilly with fine views to the sea. Alongside Narcissi, Trenoweth Farm also grows richly scented Pinks. If you’re here from April to September/October you’ll see an amazing ocean of pink blooms. Isle of Scilly flowers are available on-line and they’re delivered by post in the U.K. Their prices seem very reasonable as well. The Isles of Scilly are well worth a visit, though be warned that holiday makers are not permitted to bring cars. This means that there is very little traffic here, even in the highest populated region of St Mary’s. The Isles of Scilly helicopter service provides travellers with a hassle free, efficient transfer from Cornwall and you’ll have the chance to enjoy a scenic flight and an exhilarating first-look aerial view of these stunning islands. The once populated Samson is an interesting place to call in – now deserted, it has only the remains of ancient cottages. This is the town that was battered pretty badly during World War II. In the present day, it’s an interesting sea-facing town that has an unusual mix of 19th century buildings and a fair amount to offer the passing visitor. The centre of Teignmouth is small enough to reach any part easily on foot. Most of the facilities of interest to holiday makers are concentrated in or around the “den” area (the area of space along the main seafront). It’s here that you’ll find the pier, cinemas, swimming pool and theatre. Events here include an annual jazz festival, regattas and carnivals. For those who love the great outdoors, there’s cycling and walking opportunities as well as a host of water sports including diving and angling. Very close by to Teignmouth, at the mouth of the River Teign estuary, is the unspoilt village of Shaldon. It’s a quiet little place that is peppered with attractive cottages and the views along the estuary are really quite charming. Visitors may want to take a look inside the Shaldon Wildlife Trust.